Yesterday, I visited Hida-Takayama in Gifu prefecture, so I want to introduce about the city, Because of the city keeps some traditional Japanese style streets and it's very famous. In additionally, the area is also famous in heavy snowfall in our area. So before going there with my friend who drove his car to Takayama city, we really worried about the road condition, you would guess that the road to Takayama is very easy to be covered with snow or frozen. But this year is very special year for Japan, this winter is very warm, so it's mild winter and we couldn't see any snow on the road. It's very strange. Anyway, we really enjoyed sightseeing in Takayama, especially Takayama Jinnya that is a historical government house, the festival floats exhibition hall, traditional Japanese style and so on, and we took a lot of pictures when we found any interesting things. So I want to write about it few times, and this time is the first time and the content is about food. The pictures are Takayama ramen. Japanese really love ramen and we can try a lot of kinds of ramen in Japan, generally the taste is depends on the area, so Takayama city has the taste that is soy sauce and chicken for making stock, and the noodles are fine. The style is very Chuka-Soba. The price is 650 Yen, it's bit cheaper than common price. This picture is Gohei-Mochi. We ate it during walking around traditional streets. The Gohei-Mochi is a rice cake grilled with miso or soy sauce and it is a local dish in Gifu or Nagano prefectures. Sometimes we can find it in other area and I have some experiences eating it, and I've never felt tasty to be honest. But this time was difference it was so delicious. Maybe, we need to eat local dish in the area. 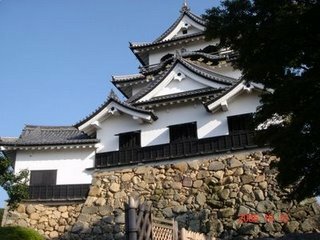 We can check the information about Hida Takayama! 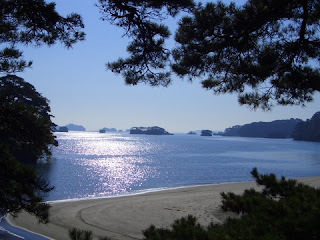 There are the three most famous scenic places in Japan, which are Amano-Hashidate, Matsushima and Itukushima. 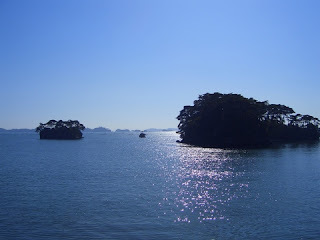 When I traveled in Tohoku area in November 2006, I also visit Matsushima! 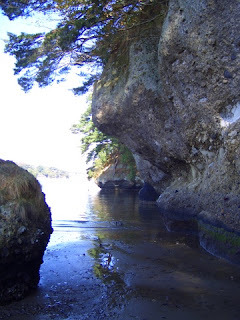 Matsushima is so famous in the fact that Basho Matsuo who was the most famous in Haiku couldn't compose good Haiku that is a Japanese poem of seventeen syllables. Finally he gave up to compose his Haiku by the really beautiful great view. He just called Matsushima three times in his Haiku. Can you guess how beautiful it is? 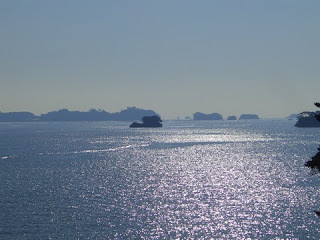 So this time, I want to update some of my friend's pictures of the great view in Matsushima. Because of my battery of my camera had gone at that time. Matsushima locates in Sendai gulf and there are a lot of small islands in the gulf, so the small islands make the special views. And the there are a lot of pine trees on the island, the pine trees also help the special atmosphere to be very Japanese view. Because, pine tree is called Matsu among Japanese, and the tree is one of the important trees for Japanese, for example we make Kado-Matsu with pine trees to celebrate Shogatsu. We took this picture on the island, and we can find a lot of the islands in the gulf. 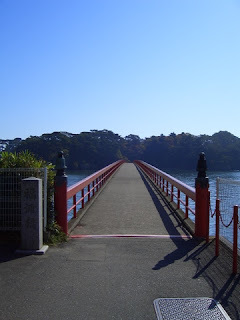 And there is a red Japanese bridge after walking few ten minute, we are require to pay 200 yen to go across the bridge. During waking across the bridge, we found the interesting thing. Can you guess what there are under the sea? Because of Sendai gulf is so famous place in oysters in Japan. After the bridge we walk around the island and took this picture. It was so fine day and we really enjoy sightseeing! By the way, there are a lot of small shrines on the islands and the small shrines were tomb long time ago. We forgot picturing them! When we visited Yamadera in Yamagata prefecture, we also found such shrines. So I guess that the facts depended on the culture in Tohoku area. I'm interested in the common fact between Matsushima and Yamadera. This picture was taken at the park on the island. We can watch the surface of the rook if we visit there at low tide. It's easy to understand the rock scooped out since few thousand years ago! We also found some geologic stratums on the rock. This is our lunch at that day! 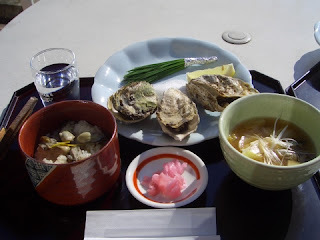 We ate oyster rice, grilled oysters and oyster soup! When we walked around the red bridge, we found the place selling a lot of oyster and visited there. 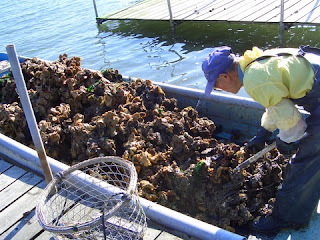 At that time, there are few small boats with a lot of oysters! It was very interesting and we talked with the fisherman about the mountain of oyster. But, we couldn't understand what he was saying by his very strong Tohoku accent. After Matsushima, we visited very huge Buddhist temple that houses of the load of the domain of Sendai grave. The atmosphere was so nice, so I really want to post on my blog. But I couldn't take any picture with my camera whose battery had gone. I study that it's very important to bring my battery charger of my camera with me when I travel anywhere. Last weekend, we went hiking in Hasso where is in Inuyama city that is our neighboring town. The area 'Hasso' is selected for one of Japanese quasi-national parks with the beautiful nature, so the area is bit famous for camping and really convenience to visit there from our town by a car. So this time, I'd like to introduce Hasso and update some pictures took in the area. This is the area map of Hasso in the campsite, and I took it to refer the map on my digital camera when we lost our way. And in front of the map, we planed our hiking course that we could enjoy our hiking whole day, and the course had some beautiful areas, which were Hasso Falls, an observation platform, marshy areas, the Virgin Falls called 'Otomeno-Taki' in Japanese, the five stairs falls. This is the Hasso Falls. It looked very simple, but it made a lot of fresh airs. At first, we planed eating our lunch in front of the falls, but there weren't enough space. So we changed our plan to eat at the observation platform. These pictures were taken at observation platform. We can find the little world on a first picture. The little world is a theme park that has a lot of international building in the park, and we can't enjoy only buildings but also we can try international foods and costumes. We usually visit there by our school trips when we are elementary school students or junior high school students. At that time, I couldn't find any interesting things and just felt tired, but now it's very interesting theme park for me. Our senses would be changed by time easily. This second picture is mt.Ontake. We can find the shape of Mt. Ontake if it's really fine day in winter. Sometimes, our teachers said "We can see Mt. Ontake today" to us in our school. I think Japanese love some big mountains, for example Mt. Fuji, and Japanese sometimes love talking about them, I think that it's Japanese sense. Recently I like the sense little bit. I also changed by time in this point. 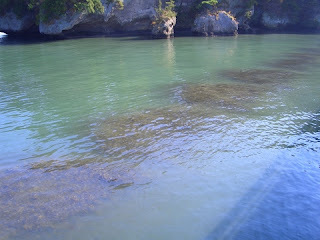 The third picture is Iruka Lake. Someday, I will write about the lake with sad and brave story. Because, the lake is so famous in our area. I took this close-up photography at swampland, and the surfaces were frozen. In my feeling, this swampland was the best in last our hiking. And the atmosphere was like this! Water came from left side and flow to right side on this picture and the width is 150 m and depth would be 1 cm. And there are a lot of logs to go across the swampland, so people can walk on them. Some of them are bit old and decay, but they are still strong. This picture are taken at the deepest point in the swampland, I guess that the depth would be three cm. We might understand that the swampland is so shallow. On the other hands, we can find a lot of small stones over the water in the shallow place. This swampland wasn't made with any rivers, it was made with spring came from the middle of the mountains, and the width of spring might be 200 m. The water is having came from long time ago, so the surface was cleaned and covered with small stones. I didn't know such swampland is in Inuyama city. After the swampland, we found the Virgin Falls and I took this picture. Before the falls, we had to cross three log bridges, I don't want to go again by my fear of heights. Especially I bring my digital camera and cell phone with me, so I couldn't fall into the rivers. Sometimes, we can find some falls and flows like this picture that I took during heading on five stairs falls. At first, we thought that the falls were the five stairs falls by the fact we can count five falls, but it wasn't. This is the five stairs falls! It's difficult to count the numbers on this picture. In summer, some children would play with the falls. This time, I enjoy the hiking in Hasso area in Inuyama city. There're some good views and falls that made us be interested in. The area were very well-kept natures, and it's very easy to walk around and safe. A lot of people usually enjoy camping in summer, but we can also enjoy hiking at a slow speed in winter. If you're interested in Inuyama, please check more! I wish you great success in the New Year! This time, I'd like to introduce one of the most popular Japanese New Year Events called "Hatsumode" in Japan. Hatsumode is the event to pay our first visit of the year to a Shinto Shrine at New Year's. So I also visited one of the biggest Shinto shrine "Naritasan" in Aichi prefecture and I enjoyed New Year countdown and Hatsumode! Both were my start of this year! I took some pictures at that time, and I would like to show some of them on my blog. This is the beginning picture and I took it on the approach to Naritasan at 23:30 in December 31st, 2006. The shrine is on the mountain, so we went up the stairs to the center of the shrine. I took the picture at midnight, but there were a lot of people to go the shrine. There is a Shinto shrine at the top of the stairs, and it was so crowded in front of the building of the shrine. The time, I was really lucky…because, I was in front of the building and it wasn't on the stairs in this year! Suddenly some of the people started the countdown before the New Year and they prayed and returned. So we could move closer! After countdown, everybody started to move to the front of the shrine, and then prayed. In my case, my wishes are different every year and it depends on my situation. I'll try that my wish will be true in this year. Finally, I would add a supplementary explanation. There are a lot of people praying at Hatsumode in Japan. But, most of them aren't pious believer in Shinto, and they prayed. So, the fact depends on Japanese culture. If you are interested in the fact, you can read this homepage.